I love to cook. I do not always want to cook. These statements are not mutually exclusive. While I will very often prep a little bit of dinner at lunchtime (the virtue of working from home), one day last week I had done nothing for dinner. I hadn’t even taken a mental inventory of my produce and pantry to come up with a quick game plan, which is something I do daily. But on this day, I was just so tired I hadn’t done any of that. And all of a sudden it was 5:35 and there was nothing in the way of dinner suggesting itself. I took a deep breath, walked into the kitchen,and opened the refrigerator. I’ve written before about how eggs are your friends and how simple is very often best, and about how in many ways, cooking for my young family very involves making small, new changes to staple ingredients to keep seasonal ingredients a little bit exciting. That evening, from some pre-conscious part of my brain “Omelette aux fines herbs” suggested itself. 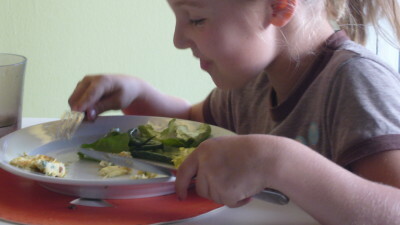 This was a much loved dinner for Kory and me, but a new twist on the omelette for the kids. 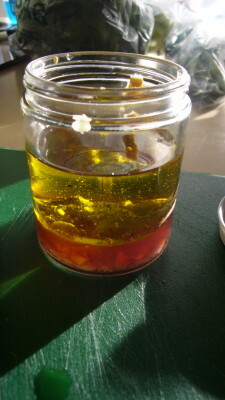 One part red wine vinegar, one part mustard and 4 parts olive oil, a smashed clove of garlic, a pinch of salt and a sprinkle of pepper. Let the dressing sit for 10 minutes so the garlic infused the dressing. Put the top on before you shake it up. I made a quick omelette with the herbs and the eggs, and tossed the green beans in with the lettuce for a really lovely, tender green salad. The dressing went on the greens. Dinner was on the table by 5:55 pm. 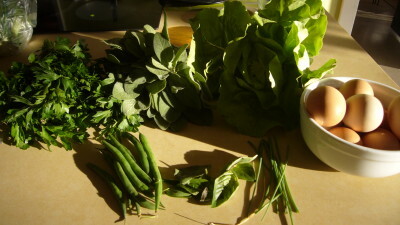 That’s less than 25 minutes from concept to table, and the hardest part was snipping the stems off the beans and washing the lettuce. 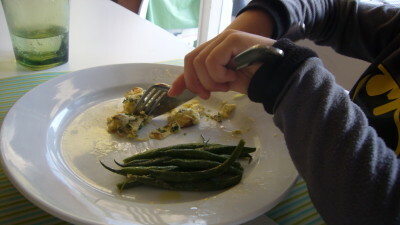 Of course, both Ella and Finn complained about the green bits in the omelette, protesting that they didn’t like them. I told Ella they were chives, Finn that they were basil, and they both raised an eyebrow and dug in and one bite was all it took to convince them that it was, in fact, delicious. The fringe benefit to this fast, easy meal is that it is also an easy, manageable fun meal with which to work on table manners. Eggs are easy to cut, and whenever possible, I encourage Ella and Finn to use their knife and fork in the continental way. This is how Kory & I eat, and both Ella and Finn at 7 & 4 are old enough to control their utensils. It doesn’t always happen in the ideal way, but this kind of dinner is the ideal place to practice. 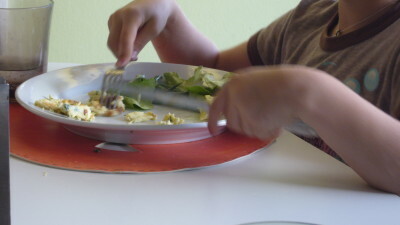 It becomes a kind of quiet contest to see who can rise to the challenge of eating like a polite little French child. Of course, it doesn’t always happen like this, but it really can be done. So, while I wished, for a minute that night, that I had a stash of TV dinners to plop on the table, I didn’t really need them. 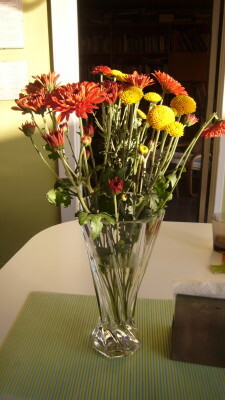 There was enough in my kitchen to make something fast and delicious, and the lovely fall flowers that live on our table reminded us that even the hastiest, thrown-together meals can be an occasion. Hey Lisa — love the emphasis on table manners. My parents were much the same — if you wanted to eat at the big table (instead of early, in the kitchen) you had to use nice manners. And when I worked as a nanny for LIza, my beloved kiddo who had Down Syndrome, we went to lunch in a restaurant on Saturdays to practice manners … it’s one of those achievements that just makes kids feel so good about themselves. (And with chickens in the backyard, we’ve had a few omelette dinners here recently too …) cheers! Thanks, Charlotte! I’ve loved reading your chicken & egg story. Also, the Saturday lunch practice is a great idea. 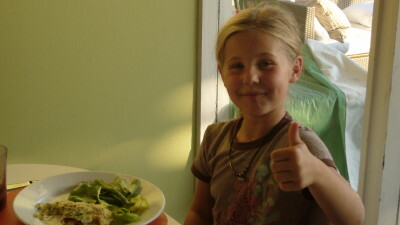 We used to eat out a lot more with the kids, in part for the very same reason you cite above. That’s a great family tradition.